Which Canadian NHL teams have improved most so far? Ahren Spylo is 30 years old and representing Canada for the first time on an international hockey stage at the Spengler Cup in Davos, Switzerland. His path is unique and the wait has been worth it. You may recognize several players performing for Canada at the Spengler Cup from their brief stints in the NHL, such as Glen Metropolit, Alexandre Bolduc, Derrick Walser, Micki Dupont and goalie Chris Mason. But have you ever heard of 30-year-old Ahren Spylo, who is representing Canada for the first time? If you're a junior hockey fan in Windsor or Oshawa or never forget a player the New Jersey Devils have drafted or you were a buddy of his growing up in Waterloo, Ont., you may know him as Ahren Nittel. Ring a bell? That's right Ahren Nittel now goes by Ahren Spylo. After Canada scored a come-from-behind 5-4 win over Vitkovice HC in its tournament opener on Thursday, Spylo took time tell his story over the phone. "My mother is German and my father is Canadian," Spylo said. "My mother had a lot of family in Waterloo. My father's parents had passed away and most of his family lived in Northern Ontario, near Timmins. "We were very close our grandparents [his mother's parents]. So to honour them, we went by Nittel." But as both Ahren and his older brother Adam, who was a fifth-round San Jose Sharks draft pick in 1997, made their way as pro hockey players, Adam decided to go to Europe to continue his career in 2003. He wanted to play in Germany and he would benefit if he applied for a German passport because he would not have to use up an import spot on a roster. Ahren, a 2002 third-round selection of the Devils, would follow the same game plan a few years later. Even though they went as Nittel back then, their birth certificates had the surname of Spylo. "It was weird and I thought about changing it back once I got over there," said Ahren, whose parents have been married for almost 40 years. "I went from being called Nittzy to being called Spy. People over here told me not to change it. They liked Spylo." Spylo has played well in Europe as he has bounced between Switzerland, Germany and Russia and back to Germany and Switzerland over the past 7½ seasons. In his second year in Europe, he scored 41 goals in 56 games for Nuermberg and all of sudden had interest from a handful of NHL teams. But the one-way contract Spylo desired proved elusive. So he went to Russia to play in the KHL for Chekhov Vityaz, scored 12 goals in 28 games and was among the top-five in scoring until he suffered an ankle injury. 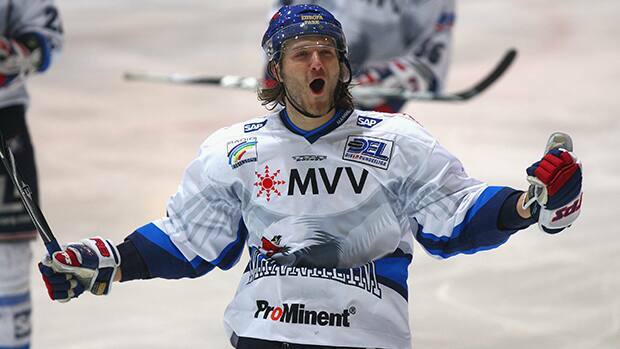 Now Spylo has found a home with EHC Biel in Switzerland. In his third season with Biel last year, he suffered a torn medial collateral ligament in his knee in his ninth game of the year when he collided shoulder-to-shoulder with a Davos opponent chasing a puck in the corner of the offensive end. The pain was something else. All he could think about was his brother Adam, whose career was derailed because of a similar knee injury. Ahren was so superstitious that he never touched his brother's knee brace. Last summer, as Ahren struggled with his training to get ready for the season, he had doubts. He didn't feel right early in training camp and had to ask his head coach and general manager with Biel to be patient with his comeback bid. "They were great," Spylo said. "They showed faith in signing me to another contract when I got hurt and they allowed me to take my time in training camp. They even told me I could take off the first 10 games if I wanted to." Spylo didn't need the extra time. Even though he was nervous as to whether his knee would hold up, Spylo has been brilliant this season. His 14 goals and 31 points in 34 games certainly caught the eye of Doug Shedden. Shedden coaches Zug in the Swiss league and also is behind the Canadian bench for the Spengler Cup. When Shedden called Spylo, the two weren't even sure the latter could play because of his German passport. But Shedden checked into the situation and because Spylo never played for Germany internationally (he would have had he not gone to Russia for the 2008-09 season), he could suit up for Canada. "I'm coming off an injury," said Spylo, who did not play in Canada's opener on Thursday. "[Shedden] asked me how I felt and I told him 'I actually feel pretty good.' He said 'the Canadian sweater will do that to you.' Maybe it does." Adam and his wife just happen to be in Davos, Switzerland to share the Spengler Cup experience with Ahren. "It's been special and exciting," said the 6-foot-3, 220-pound Ahren, who has played in two previous Spengler Cups with Davos and Mannheim. "I was telling my brother how professional it's been. Hockey Canada does it right. There's Tim Horton's coffee for us and every kind of bubble gum in the dressing room. "The way the dressing room is set up reminds me of the Devils dressing room [in training camp]. It has felt like home." Tim Wharnsby Tim's worked the sports beat at The Globe and Mail and the Toronto Sun, specializing in Canada's one true sporting obsession - hockey. He knows the players, the coaches, the backroom boys and most importantly, the fans. That's what he brings to his stories. Knowledge, fairness and understanding are trademarks of a Wharnsby story. That's what you will get here as he writes for CBCSports.ca.